Check out this great short video of all the exciting fashion and fun at May 12th Brook's Brother's event! https://vimeo.com/133965837 Use password "BrooksBrothers" to see it. 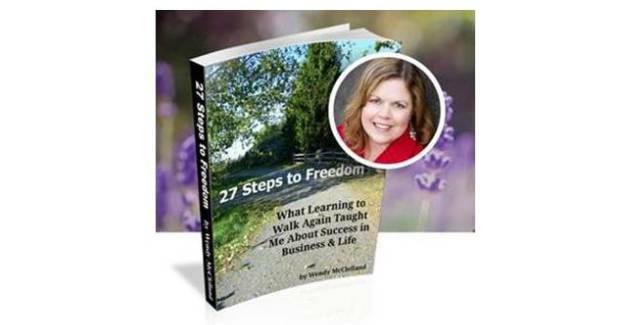 I won the book, 27 Steps to Freedom as a prize for a Facebook quiz from the author Wendy J McClelland! It’s a thin book so I thought I could finish it in one night. Not so! There were many feelings to digest so I had to come back several times to finish reading the book. Wendy was so brave to open up her life story and share the lessons she had learned as a type A business woman. She was so resourceful that she was among the frontiers to leverage internet, and built her business helping other business owners with website and online marketing. At the point of huge success with plenty of clients and even international demand to speak on this subject, her marriage fell apart. Then she suffered a major medical meltdown in the form of a blood virus that devoured her body’s essential organs, bringing her to the brink of death. Wendy has come to realize to trust others, open up and ask for help, stop overworking to the point that her body’s immunity whittle down to ineffectiveness. She also brought up the subject of letting go of the past and starting fresh, detailing how she lost her house and the life she knew and had to start from scratch with her business. She was so grateful for her parent’s loving support during this process. She also treasured her precious friendships while she was bedridden in the hospital, and learned to distinguish what is important and what is not. Wendy brought up depression and offered many resources for help, and mentioned that having a heart full of gratitude and faith for the future is absolutely necessary to overcome life’s struggles. And remember to share your knowledge with others. 1.You have a product or service that already delivers measurable value to your customers in the marketplace. 2.The market is large enough to allow for desired levels of growth. 3.You have access to the resources needed to scale the company (e.g. talented people) on a cost-effective basis. 4.You have a fundamentally desire to contribute significantly to the lives of others. 5.You also have a fundamental desire to contribute significantly to yourself. 6.You have a core level of respect for people. 7.You believe in the power of people to accomplish extraordinary things in life (the human spirit is a very interesting dynamic that can accomplish amazing things; that is what business people need to tap into to grow big time). 8.You are open to outside input and are willing to try new things and to challenge conventional norms (nobody who achieved sustained financial success got there based solely upon what they already knew). 9.You are willing to do what it takes (including potentially uncomfortable shifts if appropriate) to grow both personally and professionally as the company grows. 10.You are committed to staying strategic and to trust yourself, including trusting your own ability to discern what makes sense to you (don’t just blindly trust others). 1.Do you worry that others are just out to take from you, and get what they can? 2.Do you spend much of your time protecting yourself from others because it is a dog-eat-dog world out there? 3.Do you believe that the people aren’t what matters, and it’s the system that counts? Recap: Significant growth occurs with and through other people. Without a core level of respect for people, it just won’t work. If you are not interested in serving others, my experience is that it will be very difficult (and unrewarding) for you to maintain the experience of value to customers and staff. If you are committed to contribution, then growth can be a lot easier, and a lot of fun too! Contributing to others is not sufficient. There are enough martyrs around who wear themselves out and use themselves up helping others. If you contribute significantly to yourself while contributing to others, and you maintain balance in relationships, then growth comes easier. Are you hungry to draw on the multitude of resources that are available to you? Are you willing to step outside the box, to challenge conventional norms and to try something new in order to transform your business? 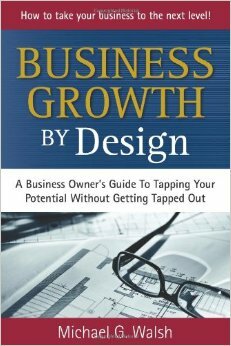 If so, you are well on your way to achieving large-scale growth in your business. WHAT stops us from large-scale growth? Craftsman and apprentice achieves 100% success as a mode of learning because the craftsmen picked their apprentices, worked directly with them, showing them what works. The apprentice goes from ignorant to aware, to applying the correct method demonstrated by craftsmen, and practice. If you trust yourself to act consistently with your core values and beliefs, and to do what makes sense to you, the road will be much smoother, and difficult decisions will become easier to make and to implement. This is your business. Make sure that it serves your goals and commitments in your life. This element allows you to maintain perspective, which will serve you well as you grow. When we get tired, it starts to affect our self-trust; we start to second-guess ourselves when we wear down. This impacts our confidence level, which in turn reduces our effectiveness. The bigger your business is, the less you are paid to DO, and the more you are paid to THINK. What are some of the areas that directly impact your personal energy levels? People stress over money, and will take short cuts such as taking on the wrong client, which will cause more problems down the road.